Equivocally speaking, Rectors of Federal Polytechnics seems to have love in the art of looting tertiary institutions in Nigeria. This is evident in the pile of petitions cascading and collapsing over themselves on the desk of the president and other anti-graft agencies calling on them to immediately expedite actions against the ever-increasing menace of looting by these supposed Doctors of Philosophy in Nigeria`s citadel of learning. A petition obtained by SecretReporters addressed to the President by an Anti-corruption Movement against the Rector of Federal Polytechnic Ekowe, Bayelsa State Dr. Seiyaboh Enetimi Idah, reveals first-class powered activities of alleged monumental fraud, stealing, contract splitting, illegal employment, money laundry amongst others being carried out by the aforementioned with impunity in the polytechnic. It was gathered that Mr Idaho allegedly divert funds meant for the development and administration of the institution into his personal accounts with which he acquires properties within and outside the country. According to the petitioner, the most recent lavished spending of the extravagant rector was the acquisition of a palatial mansion in the United Kingdom at a jaw-dropping €650,000 (Six Hundred and Fifty Thousand Pounds) amounting to over N263, 861, 910 (Two Hundred and Three Million Eight Hundred and Sixty One Thousand Nine Hundred and Ten Naira) after which he and his entire family relocated to the said location from where he is allegedly currently running the polytechnic. He also noted that the professor who is known to constantly boast of being untouchable because he was instrumental to the electoral victory of who is who in Aso rock, has allegedly spread the cancer of corruption to the Registrar, Bursar and members of the Governing Council in the institution transforming them into ambassadors of corruption, which according to the petition has earned the Polytechnic the undisputed title as the “Home of Corruption”. 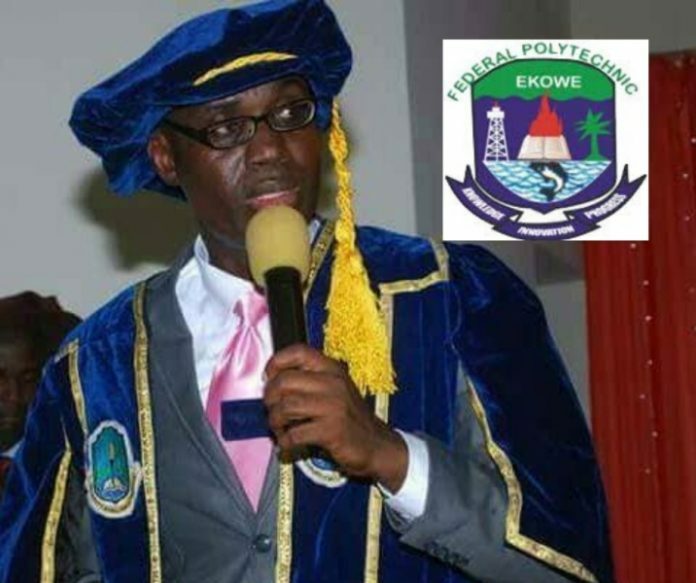 SecretReporters also learnt from the petition that that the 45 years old lecturer in the Department of Biological Sciences of the Niger Delta University (NDU), Bayelsa State who was appointed rector of the Polytechnic in 2016 by President Buhari, in collaboration with his allies allegedly pays academic and non-academic members of staff half salaries not to mention the salaries of ghost workers which provides over N48,000,000 (Forty Eight Million Naira) to be shared monthly between them with which they acquire properties worth millions synonymous to that of fraudulent politicians in the state. Furthermore, the Rector who once lived in a three bedroom apartment before his appointment, has now been transformed by the baptism of corruption into a demigod who allegedly employs individuals having fake or forged certificates as academic and non-academic staff as well as awards contracts to himself and his cronies in the polytechnic, the petition alleged. The petition went further to state that the rector has been quoted many times for vehemently boasting that as long as President Buhari and his Vice are in power under the APC led government, no petition or investigation against him will see the light of day.